An interesting post on yesterday's UK Polling Report examined how the public see themselves on a left-right scale. It is based on Friday's Telegraph/ YouGov poll. The public who see themselves as very slightly on the right-of-centre see Tony Blair almost exactly in the same ideological position as themselves. 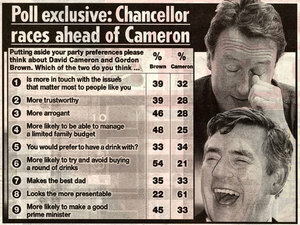 David Cameron is seen as much to the right but not as right as Tory MPs are seen, or as Michael Howard was seen. Gordon Brown is perceived as a much more left-wing figure than Tony Blair. Today and every day this week we'll be publishing some of the comments that respondents made to January's survey of the ConservativeHome Members' Panel. You can take February's survey by clicking here. Today we're publishing ten of your anonymous thoughts on the party's A list of candidates. Tomorrow they will be about David Cameron. On Saturday we will publish all one thousand or so comments. 1. I have been a party activist since 1978 and between Thatcher and now pretty unhappy - with Cameron, we're in with a real chance. As a very successful businesswoman (recently retired), I don't like positive discrimination towards women and I don't know anyone who does. We only want to be judged on merit. Thank you. 2. The A-list of candidates is a very good idea but I would prefer that it did not specify exact percentages of men and women - it would be better if the commitment were something like at least 30% men, and at least 30% women. 3. Make sure we get the best candidate for each constituency regardless of whether they are men or women, even though we still need more women candidates. See David Cameron's answers to the questions posed by mums on 'mumsnet'. Mr Cameron's web dialogue - on his first day back from paternity leave - followed a speech by George Osborne on childcare and on equal pay for women. to submit your perspective on how Conservatives should tackle Gordon Brown. With apologies - a very busy day means that I haven't had time to digest today's 'Power Report'. A responsive electoral system for the House of Commons, House of Lords and local councils to replace the first-past-the-post system. The closed party list system to be replaced. The Electoral Commission to encouragewomen, ethnic minorities, people on lower incomes, young people and independents to stand. The voting and candidacy age should be reduced to 16. Automatic voter registration at age 16 to be introduced. Donations from individuals and organisations to parties to be capped. State funding for local activity by political parties. Text voting or e-mail voting only after other reforms. 70 per cent of the House of Lords should be elected by a 'responsive electoral system' for three parliamentary terms. Select committees should get enhanced powers. Limits on power of the whips. Parliament should be ableto initiate legislation, launch inquiries and act on petitions. Local government should be able to raise taxes and administer its own finances. Meetings of ministers with business, including lobbyists, to be listed every month. All public bodies to involve the public in their policy- making processes. Citizens to initiate legislative processes, public inquiries and hearings into public bodies. Rules on plurality of media ownership to be reformed. Public service broadcasters to involve viewers in matters of public importance. MPs to be required and resourced to produce annual reports and hold AGMs. A new independent National Statistical and Information Service to provide information free of political spin. 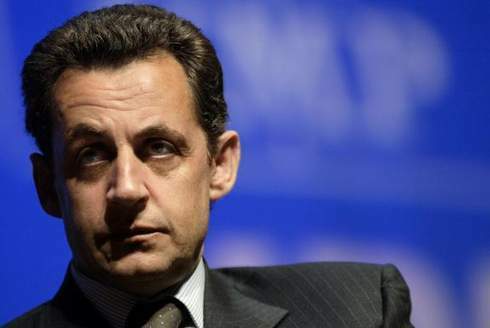 Simon Heffer has called Nicolas Sarkozy, France's interior minister, the "most exciting leader" in Europe. The Economist sees him as the anti-establishment candidate - championing "ordinary folk—but policemen, firemen and supermarket shoppers, not the farmers of yesterday's France". BBC Online notes how he "seduces" the media: "Every French news bulletin features the man who made his mark as an authoritarian interior minister - tough on crime, and tough on immigration." "It is not certain that "Sarko," as he is called in the press, will win, but it is certain he will set the tone. To adapt a metaphor of the political scientist Samuel Lubell, he is the "sun" of the French political scene, generating all the light and ideas. The other candidates are like "moons," merely reflecting the light he gives off--agreeing with Sarko on this, disagreeing with him on that, and sort of agreeing with him on the other thing." Sixth, . . . I'm persuaded that, before sharing, you have to create wealth. I don't like egalitarianism." "He intends to shrink the state, reform the profligate, bureaucratic, and job-killing "French social model," cut taxes, promote ethnic harmony (through the controversial expedient of affirmative action), normalize Islam in French society, and shore up France's alliance with the United States. These plans amount to what supporters and detractors call la rupture. As Sarkozy told a roomful of journalists at UMP headquarters in January: "You can't run France on the ideas of 30 years ago."" "Most people in France pay lip service to this idea, but Sarkozy acts on it. A great deal of the work Sarkozy has done with the two-year-old French Council of the Muslim Faith involves getting non-pork dishes into school cafeterias and arranging for Muslim burials to be allowed in municipal cemeteries." As the right reinvents itself in various parts of the world, the progress of Nicolas Sarkozy will be as fascinating as it is likely to be eventful. "Parts of Britain are now almost wholly dependent on the state. In Manchester Blackley, 67% of the electorate are government employees or welfare clients, the figure is 67.5% in Liverpool Walton and a staggering 71% in Cynon Valley. In some areas where old-fashioned manufacturing or mining has long since died out, government has taken its place, leaving ghettos of dependency where there is no room for the market economy to breath. Such places will be forever dependent on wealth being generated in those parts of Britain (largely London and the south-east) which are not yet socialised; no wonder they are staunch supporters of Mr Brown’s ever-expanding state." A GOOD WEEK FOR... Paul Goodman, Robert Key and Sir George Young. The WriteToThem website revealed that these three Tory MPs - and Conservative MPs generally - were the fastest responders to constituent email. A BAD WEEK FOR... Theresa Villers. 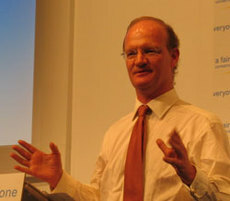 The North London MP defended the jailing of David Irving. Visitors to this site were almost universally unimpressed. 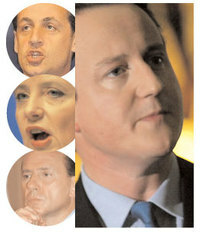 TORY POLITICIANS OF THE WEEK... The 'Times Nine'. Nine Tory MPs wrote a letter to The Times complaining about the Church of England General Synod and its one-sided decision to boycott companies that make products used by Israel in the Palestinian territories. PLAY OF THE WEEK... I can't think of anything political in this recess week so I'll suggest Barcelona beating Chelsea and Henry's breathtaking goal against Real Madrid. CONSERVATIVEHOME POST OF THE WEEK... My suggestion that big donations to the Conservative Party be limited to something like £100,000pa as part of a wider campaign to encourage more diverse funding of the Conservative Party. Many of you disagreed with me but the discussion was excellent. EXTERNAL BLOG POST OF THE WEEK... Gerard Baker's expose of the opportunism of too many US politicians - including Bill Frist and Hillary Clinton - over the sale of some US ports to a Dubai firm. GoldList candidate: Priti Patel (96). Three more people were added to ConservativeHome's GoldList this week - Priti, James Cleverly and Lee Rotherham. Iain Dale narrowly missed out and is keeping Adam Rickitt company on the list of rejected nominees. "Has Theresa Villiers started a 'Jail Livingstone' campaign yet?" New Labour swept to power with promises to help the 'socially excluded' and promptly set up the Social Exclusion Unit. Sadly for the country, its methods of doing so have achieved very little. 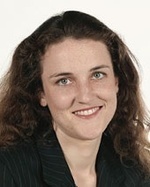 Now there is to be a new Social Exclusion Minister, will there be a new approach? "There is a growing mood on all sides of the debate that civil servants and ministers in Whitehall may not have all the answers and that a centralised approach is not the answer. Socially excluded people tend to lead complicated and chaotic lives and are not necessarily the easiest people to help with initiatives and task forces." "The poor today suffer a poverty of the spirit, no less - a poverty of relationships, of opportunity and of access to the supporting associations that simultaneously soften the blows of life and stiffen the individual to withstand them. "Social exclusion" is the opposite of that old-fashioned term "neighbourliness", the sense of belonging to a moral community that both extends charity and expects self-reliance." Hopefully, the Conservatives' Social Justice policy group will come up with some innovative policies which will genuinely tackle the root and branch causes of social exclusion. "When the Education Bill is published, if we can at least see the building blocks for future reform then there is a strong case for backing these measures. Our test will be a very simple one. Could the Bill raise the quality of education by increasing the freedom of our schools? If we believe that on balance it does do that, then we would back the Bill." Thirdly, existing schools have to be able to respond to the challenge of new entrants. This is crucial to avoid the problem of pupils being left behind in poorly performing schools. Often this means that existing schools have to be free to recreate themselves. They have to be able to change the way they work and reward teachers so as to raise their performance and recapture the students they are losing." "London's mayor has been suspended from office for four weeks for comparing a Jewish journalist to a concentration camp guard." According to BBCi, the Orwellian-sounding 'Adjudication Panel for England' ruled London's Mayor Ken Livingstone had brought his office into disrepute when he acted in an "unnecessarily insensitive" manner. "This decision strikes at the heart of democracy. Elected politicians should only be able to be removed by the voters or for breaking the law. Three members of a body that no one has ever elected should not be allowed to overturn the votes of millions of Londoners." Nicky Gavron, Mr Livingstone's deputy, will be mayor for the four week ban that begins on 1st March. Editor's note: "Ken Livingstone was wrong to say what he did and he has arrogantly refused to apologise but he has a point about this unelected 'Adjudication Panel for England'. Mr Livingstone has the right appeal to the High Court. I hope he does and I hope he overturns the Panel's decision. The time for Mayor Ken to be suspended from office (for good) is at the next mayoral election. London's Jewish community and all others offended by his insensitivity should relish the opportunity to vote him out." Nine Tory MPs have written to this morning's Times to protest against the Church of England General Synod's recent decision to encourage disinvestment from companies that make products used by Israel in the Palestinian territories. Click on the scan to read an enlarged copy of the letter. "Synod might on reflection want to consider the plight of Palestinian Christians whose right to worship is explicit in Israel, yet becoming increasingly difficult within Palestinian territories, and who view with alarm the success of Hamas. They might be puzzled as to why there has been no similar overt manifestation of concern by the Church against such an explicitly anti-Jewish and anti-Christian movement." A 5% bounce back from their troubles of January has hurt Labour and helped David Cameron's Conservatives reassert a narrow 2% lead. But YouGov also discovered that Labour's flip-flop attack on the new Tory leader may be bearing political fruit. 63% of those questioned by YouGov agreed that David Cameron "talks a good line but it is hard to know whether there is any substance behind the words". A MORI poll for today's Sun gives Labour a 3% lead. 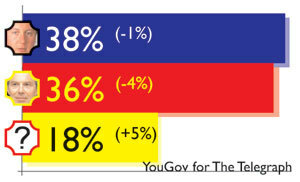 The projected Tory share of the vote is down 5% on last month with the LibDems up 3%. Half of MORI's respondents were unwilling to express an opinion on David Cameron at this early stage of his leadership but of those who did... the Tory leader was satisfying twice as many people as he was dissatisfying. William Hague's decision to delay exit from the EPP is looking more and more hi-risk. ConservativeHome feared that delay would encourage opponents of Mr Cameron's campaign pledge to dig themselves into increasingly entrenched opposition. The clearest sign that that is happening comes with today's news that key European leaders are threatening to turn their backs on Mr Cameron if he does pull his MEPs out of the European Peoples' Party. "The Tory leader has been told that senior figures such as Angela Merkel, the German Chancellor, and Silvio Berlusconi, the Italian Prime Minister, are threatening to cut bilateral relations. In all 11 leaders of right-wing governments and parties have said that they will refuse to work with Mr Cameron if he withdraws Tory MEPs from the European People’s Party grouping in the European Parliament. The list includes Nicolas Sarkozy, the French Interior Minister and likely presidential candidate, and Mariano Rasjoy, the head of the opposition Spanish Popular Party." The bullying reaction of the European leaders is, of course, childishly unacceptable but Mr Cameron must act quickly if other federalist forces are to be prevented from organising against his EPP pledge. Shadow Chief Secretary to the Treasury, Theresa Villiers MP, defended Austria's decision to jail David Irving for 'Holocaust denial'. Speaking on BBC1's Question Time (pictured above with fellow panellist Art Malik), the Tory MP said that the Holocaust was a uniquely depraved event in human history. She highlighted the fact that six million people had been exterminated in an industrial killing process because of their Judaism, their disability, their ethnicity or their homosexuality. She discussed the rise of anti-Semitism in Britain, including in her own north London constituency, and the Iranian president's desire to wipe Israel off the face of the map. She insisted that she was speaking in a personal capacity and not for the party. Her position received a distinctly lukewarm reception from the audience. "David Irving should not be in jail. We can do better than that. I wish I could tell you that the Irving trial is the only way in which my belief in the power of truth is being tested. But it isn’t. Across the Middle East now, Holocaust denial has become commonplace. It was not difficult last week to spot the banners reading “God Bless Hitler”. The President of the Palestinian Authority denied the full truth of the Holocaust in his PhD. I wish I could tell you that never again will anyone be able to kill millions of Jews, but as we speak Iran is well down the nuclear path and threatens to eradicate Israel. David Irving is the least of our troubles. But through it all we must hold fast to this: that we must always be ready to meet force with force, but lies — lies we fight with truth." "The condemnation of former Tory MP Howard Flight's sacking on the eve of last year's general election was virtually universal among his parliamentary colleagues. So I am interested to hear that the former Arundel MP is well on the road to rehabilitation. "There's been no great fanfare about it, but Howard has just been put back on to the approved candidates' list," says a party source. "He has also been made president of the Conservative City Circle, where his contacts in the square mile will come in extremely useful. The only remaining hurdle for him is an interview for a place on the A list of top-notch candidates - but that really ought to be a formality given the circumstances."" We'll submit Mr Flight to the 'GoldList treatment' soon. Priti Patel is today's nominee. (My thanks to Justin Hinchcliffe for drawing my attention to the story). The DfT estimates that a changeover would cost £750m. 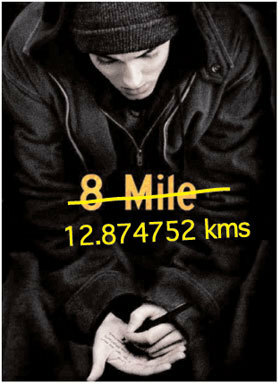 The UKMA puts the cost at only 10% of that. Geoffrey Howe joined the Kinnock-side of the argument at the end of this morning's Today programme. At least I think he did. I think I may have nodded off as he started to make his case. Today found Peter Hitchens to oppose Lord Howe. The cost of conversion was too great, he said. The US was still largely imperial and was the world's most dynamic economy. The British people hadn't been asked their opinion. And, in a clinching argument likely to appeal to Christopher, his brother, he noted that no decent bottle of wine is sold in litres. "The transfer of wealth from the productive to the unproductive sector, accomplished with remorseless determination by Gordon Brown, is the prime reason why (as the OECD reported yesterday) Britain's economy now has a lower growth rate than the EU average." (1) Ireland’s "world-class" education system: "On various different rankings it is placed either third or fourth in the world. By contrast, Britain is ranked 33rd and our poor education performance is repeatedly identified by organisations such as the OECD as our greatest weakness... It is telling that even limited education reform is proving such a struggle for the Prime Minister." (2) "World class" research and development: "Using the best R&D, businesses can grow and make the most of the huge opportunities that exist in the world. That is why it is shocking that the level of R&D spending actually fell in Britain last year. Ireland’s intellectual property laws give incentives for companies to innovate, and the tax system gives huge incentives to turn R&D into the finished article. No tax is paid on revenue from intellectual property where the underlying R&D work was carried out in Ireland. While the Treasury here fiddles with its complex R&D tax credit system, I want to examine whether we could not adopt elements of Ireland's simple and effective approach." (3) Competitive tax levels: "In a world where cheap, rapid communication means that investment decisions are made on a global basis, capital will go wherever investment is most attractive. Ireland’s business tax rates are only 12.5 per cent, while Britain's are becoming among the highest in the developed world." "In Ireland they have doubled spending on public services in the past decade while reducing taxes and shrinking the State’s share of national income. So not only does Ireland now have lower business and income taxes than the UK, there are also twice as many hospital beds per head of population." George Osborne is making the right arguments about Gordon Brown's tax burden and its effect on Britain's economy but will he make bold and fast enough conclusions to start making the necessary case for tax relief to the British people? And, today, he's criticising David Cameron's education and environment policies. Is Mr Wheeler the donor who has 'recalled' a £250,000 gift to the Conservative Party? All this makes me very uncomfortable. I admire Mr Wheeler's Euroscepticism and agree with his reservations about current Tory policies on academic selection and Kyoto but I do worry about his influence. In last year's leadership election campaign the views of big party donors were constantly sought by the media. Not so long ago Lord Ashcroft argued that political parties should be able to "accept financial support — cash, benefits in kind and credit — from whomsoever they choose and without financial limit". His only significant condition was openness. 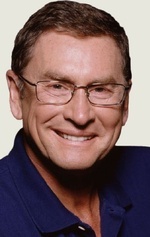 Lord Ashcroft is a generous man who helped save the Conservative Party from financial disaster when he was William Hague's treasurer - the party should be grateful to him - but this is poor advice. Big money has spoilt American politics. Individuals like Mike Bloomberg, Mayor of New York, and Jon Corzine, Governor of New Jersey, invested their substantial personal fortunes in buying office for themselves. Members of America's House of Representatives start fundraising for their campaigns as soon as they are re-elected. The Abramoff affair is now rocking the Republican Party establishment. At the moment there is nothing to stop a UK citizen or other permissible donor making unlimited donations to political parties. Imagine if the late James Goldsmith hadn't just funded the Referendum Party for the 1997 General Election but had set up a £200m endowment that would have allowed it to campaign in perpetuity? That would have been perfectly legal under existing rules. David Cameron has said that he wants to stand up to big business. This site - not uncritical of him - has welcomed that commitment. Conservatives should be the friends of free and competitive markets. That doesn't mean befriending big businesses who can, Adam Smith warned us, conspire against smaller firms and the wider public interest. I don't suggest that the Conservatives should immediately declare that they will not accept any big donations - that would be the equivalent of unilateral financial disarmament in a world where Labour would still be receiving millions from the likes of Lord Drayson, Bernie Ecclestone and Lord Sainsbury. I do think, however, that Conservatives should support a more diverse basis for party funding. I'm not sure what the maximum donation should be but £100,000 would seem enough. What do you think? In place of relying on big money from big business Britain's political parties would have to seek money from private citizens. That would be more democratic. The internet provides political parties with enormous new opportunities to raise new monies. At the same that a cap was introduced on big money donations I would favour tax relief on small donations of, say, up to £100. Giving to political parties is a comnmunity-minded thing and it is better for public money to match the preferences of lots of individuals than being allocated by politicians in private dialogue with one another in Westminster. "Independence as a name is catchy, reduces the emphasis on Europe a little and allows us to focus more on domestic policies... Rebranding will help show that we're not just about leaving the European Union but about being a party of opposition to the three main parties, who share the centre ground. We will push for independence for local schools, councils, hospitals and planning and champion low taxes, which the Tories no longer seem interested in doing." "I've every sympathy with their view on Europe, I'm just not sure what it is they're trying to achieve. They'd be much better off remaining a pressure group. Shouting from the sidelines with five per cent of the vote doesn't seem like a particularly constructive way of advocating their cause."